KS Petrov-Vodkin is a distinctive Russian artist, who came from an ordinary family of servants and just got a chance to learn by miracle. His painting technique is original, and his works are recognizable. Heroes of the paintings are ordinary people from the people. They are so clear and close to the artist. The painting depicts a guy and a girl. In the distance is a village scattered across a hill. The girl dreamily sits with her legs tucked up. She is modest and rustic, her face expresses pacification and peace. The guy with love looks at the girl. Obviously, young people have a date, they are in love. The guy is waiting for reciprocity from the girl, and the girl is modestly and aloofly absorbed in her thoughts. Such a plot is typical for summer evenings in the village. And the landscape and the setting has to romanticism. The artist realistically depicted the images of heroes. The artist himself lived simply and understood the soulfulness of the Russian people. The picture is made with smooth lines, this is a feature of the artist’s individual technique. The author preferred rounded shapes, his designs are streamlined and harmonious. The image looks childish, even fabulous. Houses in the village hang unnaturally from a hill, but the trees and the characters are quite realistic. The artist perceived reality through the prism of his creative worldview. Perhaps in his heart he still remained a child, who was wandering around the village, which seemed to him fabulous. It was in his imagination that the author drew inspiration. The canvas reflects the role of man in the world. The figures of people in the foreground. A girl with a guy is sitting on a hill, above all. Thus, the artist presents a person by raising him on a pedestal. Nevertheless, the couple looks harmoniously against the backdrop of a magnificent landscape. 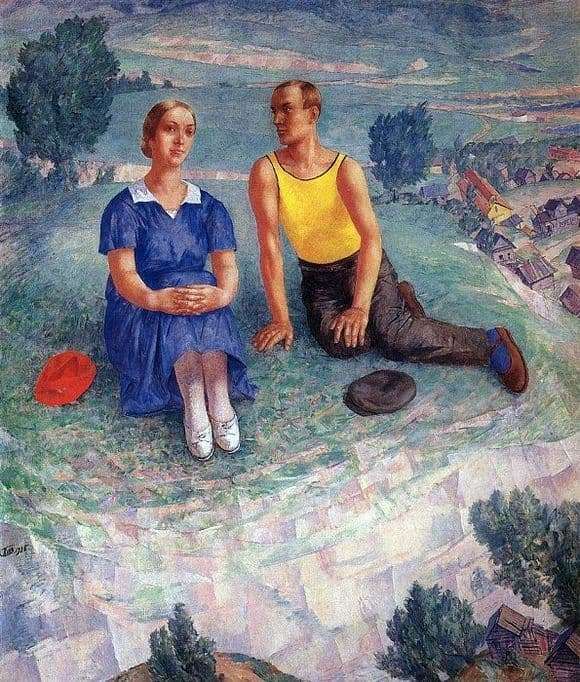 KS Petrov-Vodkin shows that it is necessary and possible to live in harmony with nature, because a person is also part of the surrounding world.